CRUSTACEAN LARVA - JURASSIC SOLNHOFEN GERMANY. CRUSTACEAN LARVA - JURASSIC, SOLNHOFEN, GERMANY. 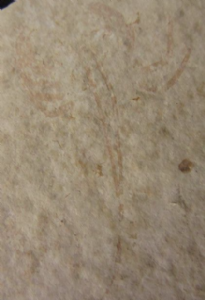 A rare and unusual example of a large crustacean larva on lithographic limestone. The long thin body and paired jointed legs are very well defined. Not something that you see offered for sale very often. Matrix : 9.5 x 7.3 x 0.7 cm.